Broken Spoke Bike Co-op | We need a new home! Back in early 2013 we were given the keys to our current home. It was a dusty, dark, cold and lifeless space, that used to be the hub of the county’s post office. 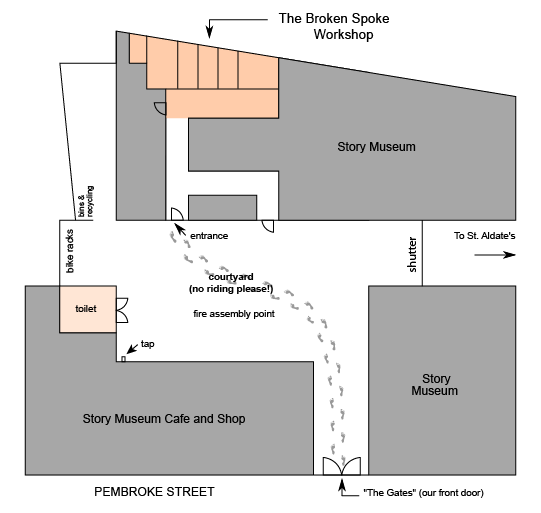 Through an easy-going arrangement with the site’s owners, the Story Museum, Broken Spoke was able to blossom and flourish into the diverse and vibrant organisation it is now. We’ve gone from running just one workshop a week on a Saturday to opening to the public five days a week, running private daytime & evening classes, co-ordinating a cycle training programme and basing an office of 4 full-time staff out of the space. Our current operation takes up at least 100sqm (which is 1076sqft) and at various points of the year, we overflow a bit! However the time has come for us to find a new space. What does a bike project need for a home? Well a workshop doesn’t need to be all that homely. A secure and weatherproof shell (i.e. walls, roof, doors and locks) are vital, as is adequate lighting & a few electricity sockets. Furthermore, without a connection to the internet, we’d struggle to run the rest of the organisation on site. 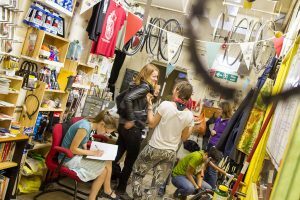 Lower priorities for the space include a heating system as most workshop users are active & moving when fixing their bikes. Running water within the building isn’t top of the list either since we’ve only just had our own sink installed after nearly 4 years of filling jugs from an outdoor tap! That said, access to water and a toilet are essential. Fortunately for us, the income from our activities has always paid the rent, the wages and the bills, due in a large part to our annual rent being relatively low (below £10k). Different spaces will have different rents though and if our expenditure changes, we’re likely to need to change our programmes. For example, those which generate greater income for fewer costs may have to be prioritised over others to cover a higher rent. While our spread of different programmes makes us flexible, there are some things we can’t do. It would be a big ask to take on a commercial lease (tens of thousands of pounds per year rather than the less than £10k that we’re currently spending). Also, a premises outside of Oxford’s ring road would drastically reduce the number of bodies coming through the door…we’d have a hard time creating a culture of cycling in Oxford if we were outside of Oxford! Reading Bike Kitchen is in Jackson’s Corner, a giant old department store. Manchester’s Platt Fields Bike Hub is in an old boat house. The Pedallers’ Arms in Leeds is in an old industrial unit/warehouse. Edinburgh Bike Station used to be underneath Edinburgh Waverley Station. The Windrush Bike Project runs bike workshops at Cogges Farm, a living farm museum. We have a few leads we’re exploring – the handlebars of some helpful volunteers have pointed us into some conversations with good potential. 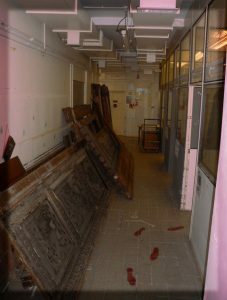 However our hunt for a new home is still ongoing and, with less than a year to go until we need to leave the Story Museum, we need to get the wheels spinning to our new front door! If you know where we could go, or if you want to help us find our next home, please email newhome(at)bsbcoop(dot)org.